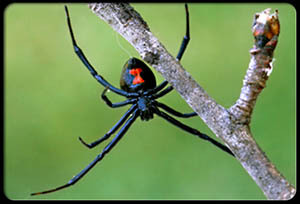 Black widows are spiders, but not just any kind of spider: they are highly poisonous. The venom of these spiders is 15 times stronger than a rattlesnake’s. While the term “widow” typically refers to a woman whose spouse has died, this dangerous spider gained its name from its tendency to eat males after mating. Black widows are very easy to spot. Females are a shiny black color and have a reddish-orange hourglass pattern on their abdomen. In contrast, males are brown or gray with small red spots. Black widows live on every continent, except for Antarctica. They typically stay on the ground and in dark places, such as drainpipes and under logs. This creepy-crawly species has an interesting reproduction process. The black widow lays about 200 eggs in a round papery sac, which is attached to the spiders’ web. After these eggs hatch, they stay in a cocoon for about a month before emerging. These spiders are also well known for their webs. The female hangs upside-down in her web to wait for unlucky prey, like flies and mosquitoes or even larger insects like grasshoppers. Once prey is caught in the web, the black widow then weaves a glue-like substance around them, injects its poisonous venom, and paralyzes its victims. The spider will not get caught in its own web, however, because it is coated with an oily substance. Though the black widow is a fierce predator, it is also the prey of birds and other larger creatures. These spiders can protect themselves with their venom, though, and may even bite humans, who could then experience pain and nausea. While black widows are small, typically measuring only 1.5 inches, they can still be very harmful when threatened. Thankfully, their bites are rarely fatal. Clearly, black widows are very interesting and unique creatures!